Hello everyone! We would like to give a warm welcome to Videoslots joining the Casino4U family! It is a pleasure for us knowing that they chose to partner up with us, and we always take that as a long-lasting and enriching relation. Videoslots launched in 2011 and since then they have gained a reputation as being one of the most innovative casinos when it comes to new ideas and unique features. And since they treat each and every player as a VIP player, offering them a vast range of bonus systems and top of the line support 24/7 all days around the year. The official Video Slots Casino site sets very high standards and when it comes to their goals, the sky is the limit. They have overcome many challenges with a smile on their faces, and when they have targets, they always make sure to hit a bullseye. However, they cannot do this alone. Therefore, they want Casino4U to be part of it. As a result, we now work together and strive to be the best. 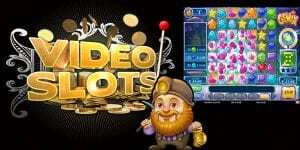 Why Should You Choose Video Slots Casino? Battle of Slots is an in-house created, unique gaming experience available only at Video Slots Casino. It is the very first social online casino experience where you can chat and Battle against friends and other players on the site. Battles are available in games by NetEnt, Thunderkick and Play´n GO. In addition, you will be playing Poker-inspired kind of Battles such as Sit & Go´s and Freerolls, while winning various prizes. My RTP is a one-of-a-kind feature that lets all players access information such as your hit rate, the total number of spins made, overall RTP (personalised), your own RTP compared to the games’ and more. All information available by one press – on your profile. The page is always updated, so you can easily keep track. Furthermore, this site offers 2,800 unique game titles by over 90 game suppliers. As a result, making this one of the biggest and most vast online casino in the industry right now! Daily, new games are added and we are working together towards new goals constantly. In addition, the trophy system is one of the many ways of giving rewards to our players. This is where you have certain milestones set in almost every game we offer. Once you reach one of these milestones you receive a Trophy. And, if you are lucky, there is a Reward hiding behind it. These Rewards differ from wager free extra spins in our slots, battle tickets, or deposit bonuses just to mention a few. Moreover, every week you will have the chance of earning the Weekend Booster, which is wager free winnings that you earn simply by making spins in our games. You are automatically participating and winning after you have made your first deposit. There are 4 races every month, where a total of 11,288 players share the prize pool of £90,000! The winnings are paid out every Monday – wager free.